Hokitika soon to be "Motorhome Friendly"
Hokitika is soon to be officially welcomed into the New Zealand Motor Caravan Association’s nationwide Motorhome Friendly scheme. On March 22, a longstanding local NZMCA member, Jim Barnes, will present Westland District Council Mayor Bruce Smith with certificates and signs acknowledging Hokitika as New Zealand’s 50th Motorhome Friendly town. The move is set to provide a healthy boost to tourism spending in the town and surrounding area. Hokitika’s new status is a positive reflection of both Council’s and the Association’s drive to share the benefits of Motorhome Tourism, without adding extra strain to local facilities or heaping extra costs on local ratepayers. The promotion of Hokitika as a Motorhome Friendly town will be funded entirely by the NZMCA, at no cost to local ratepayers. Mr Lochore explains that the Motorhome Friendly status offers significant economic benefits to participating communities by attracting more NZMCA members (a total of 80,000 nationwide) and other tourists in Certified Self-Contained vehicles. “At a time when tourism in this country is enjoying an unprecedented boom, we believe it is vital that the benefits are not confined to the traditional tourist ‘hotspots’ but are shared with Councils and communities nationwide,” he says. 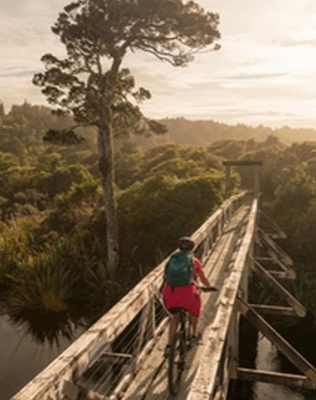 “NZMCA members love to travel and enjoy a wide range of events and activities; A&P Shows, music festivals, wine and food festivals, cycle trails, fishing contests, walking weekends, gardening festivals – you name it,” says Mr Lochore.